Scotty's use of the words 'their power is simple impulse' has been widely misinterpreted and misquoted as 'they have only impulse drive' or 'they do not have warp drive', or some equivalent variant. Even the official Star Trek Encyclopedia has reproduced this error on its entry on the Romulan bird of prey. Non canon sources have also followed this line of thinking, and some novels maintain that the Romulans did not acquire ships with warp drive until their use of the Klingon D-7 class ships, the Klingons receiving Romulan cloaking technology in return. The idea that the Romulans as a species did not have warp drive is virtually impossible to believe. The episode 'Balance of Terror' establishes that the Romulans fought a war with Humanity approximately a century prior to the episode, putting it sometime in the 2160s. This is over ten years after Archer's Enterprise made its maiden voyage in 2151; at the time Humans had possessed low level warp travel for nearly a hundred years. Even in 2151 at least three more NX class starships are under construction, with more to come. Certainly Earth's Starfleet should have had plenty of such ships on hand for the Romulan war. The idea that a species which was confined to sublight speeds could hope to fight a war with one capable of warp 5 is absurd, to put it mildly. That the Romulan Empire had warp drive but that this particular class of ship did not is slightly more believable, but still flawed. Remember that the success of this ship is said to be taken as a signal for an invasion of the Federation. Yet these ships would be useless in such an invasion - it would take them decades to even reach their targets. 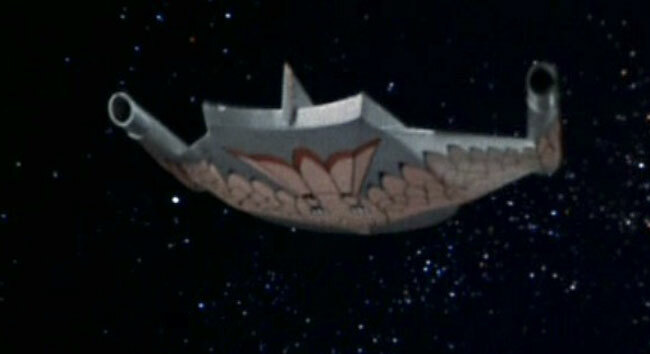 Some novels have made the claim that the Romulan bird of prey was without warp drive itself, but was carried by a larger craft which did have warp drive. This would at least allow them to reach their targets, but it would not make them effective combat vessels - ships without warp drive would never be a match for those which could fight at warp speed. Kirk's Enteprise was quite able to fire phasers and torpedoes whilst at warp speed; it could easily do a fast strafing run past a sublight Romulan ship, hitting it without any fear of return fire. But more than this, the episode 'Balance of Terror' does itself strongly indicate that the Romluan bird of prey has warp drive. Certainly there is nothing in the episode to contradict this idea - remember that Scotty only made a statement about the power of the ship, he said nothing about its drive system. The Federation powers its warp drives with a matter/antimatter reaction, but uses fusion reactors for the impulse engines. So it's perfectly possible - even likely - that 'impulse power' could be equivalent to 'fusion power' in the mind of a Federation engineer. If this were so, then Scotty would be saying that the Romulan ship's warp drive was powered by fusion reactors. The ship certainly appears to have prominent warp nacelles on either side. Hardly conclusive, but it does fit with the idea that the ship had a warp drive. There are a few cuts in this scene, but none of them affect the timeline. When Kirk cuts contact with the bridge he walks to the podium, and nods for the music to start. There is then a cut to the bride entering, with the music playing unbroken over it. There are then cuts to a closeup of the bride, back to Kirk, back to bride, then back to Kirk. The music continues to play unbroken over all of these. As the music fades out, Kirk begins his speech. The shot cuts to bride and groom, then to a wide shot of Kirk, with Kirk speaking unbroken in each case. Then the alert sounds. Since none of the cuts in the scene affect the timeline, we know that sixty five seconds pass between Kirk receiving the first message, reporting that outpost three had gone silent, and the second reporting outpost four under attack. The only other way the time could be increased is for Spock to have waited before passing the first message to Kirk of events. Yet he specifically states that outpost three has gone silent 'now'. Certainly a few seconds must have passed to allow Spock to receive and pass on the information, but this cannot have been more than a minute or so at the very most. We are left with the conclusion that there was no more than one or two minutes between outpost three going silent and outpost four being attacked. After the opening credits have rolled, Kirk enters the bridge and the following dialogue is heard. Crewman : 'Position eight minutes from outpost four at this velocity, sir. There are a few more lines, and then Kirk asks Spock to put this star section on the screen and superimpose the Enterprise's position. 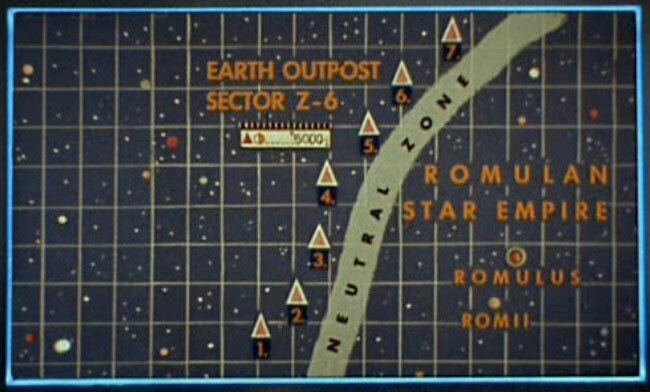 This is a capture of the map; the Enterprise is the bright dot near the bottom left of the screen. Unfortunately, the speed at which the Enteprise is crossing the screen does not match up well with the dialogue claiming eight minutes to arrival at the outpost. I will look at each in turn, starting by assuming that the dialogue is correct. The Enterprise is approaching outpost four at maximum speed, and is eight minutes away. The ship is 240 pixels from the outpost on this image, so it is travelling at a speed of 0.5 pixels per second. The Romulan ship crossed between outpost three and outpost four, a distance of 46 pixels, in no more than a few minutes - let's be exceptionally generous and say it took ten minutes. That's a speed of 0.077 pixels per second. Hence, the speed of the Enterprise was at most only 6.5 times higher than that of the Romulan warbird. According to the official scale warp 8 equates to 512 times lightspeed, so the Romulan ship averaged nearly 80 x c between the outposts. For the Romulan ship to be sublight, the Enterprise top speed would have to be less than 10 x c. Even Archer's Enterprise of a hundred years before was well over ten times faster than this! The Enterprise has travelled a distance of 116 pixels in the last 86 seconds - a speed of 1.35 pixels per second. At this rate it is barely more than another 90 seconds from the outpost, a total journey time of significantly less than the stated eight minutes. Strangely, the Enterprise also seems to be heading for outpost three rather than outpost four. Whatever the destination, the speed of the Enterprise here is significantly higher than before and so the ratio between the speed of the Enterprise and the Romulan ship rises to 17.59 : 1. But this still isn't nearly enough to allow the Romulan ship to be sublight - for that we need a ratio of at least 100 : 1, if not more like 500 : 1. The only way around this conundrum is to suppose that the attacks on outpost three and four were actually carried out by two completely different ships. While there is nothing in the episode to directly contradict this, nor is there anything to support it. It is certainly within the bounds of possibility that the ship in Balance of Terror had no warp drive, and indeed it is possible that the Romulans as a species had no warp drive until after this episode. But in order to believe this, it is necessary to believe that there were actually at least two ships involved in the attack; that even though the success of this ship was to be the signal for war, they would take little or no part in that war; that Kirk was deliberately toying with the enemy ship, choosing to stay at impulse so as to give the Romulans a sporting chance of victory - a choice that ultimately cost him the life of one of his crewmembers. It is further necessary to believe that the Earth-Romulan war was some kind of turkey shoot in which Earth forces simply rampaged over Romulan space, destroying enemy ships and bases at their whim. And the only thing supporting this idea is the interpretation of Scotty's 'power is simple impulse' to mean 'no warp drive'. If we do not interpret this line in this way, however, then all of the above problems vanish completely. The Earth-Romulan war becomes a real one, the Romulan ship becomes a viable combat vessel, Kirk's fight against it becomes realistic, the threat to the Federation becomes real. This might raise the question of why the Romulans ever bought in the Klingon battlecruiser design, if they did not gain warp drive through the deal. But in fact it is not so hard to believe - after all, the Federation had just defeated their 'best and proudest' ship, so the Romulans have more than enough reason to try and supplement their own fleet with another design. Overall the canon evidence is not totally certain in either direction, but certainly indicates that the Romulans have had warp drive since before the Earth-Romulan war, and that the bird of prey was equipped with this technology.